Connected vehicles and assets are part of the Fourth Industrial Revolution. Using powerful, real-time data to direct asset management in areas including proactive maintenance, routing and getting the right size and mix of fleet vehicles. This next generation of telematics gateway offers a flexible vehicle interface technology that is compatible across multiple fleet types with a more robust LTE network connectivity. They are also built to withstand harsh environments, making it easier and safer for our customers to operate in any climate and conditions. New to the CalAmp telematics gateway product line is the TTU-3640 which delivers on all of the above features and more! The TTU-3640 is designed to support various vehicle assets, both light & heavy duty, making it easy to on-board, integrate and manage. TTU-3640 offers advanced network connectivity with LTE CAT-1 for IoT applications which enables our customers to stay ahead of the curve as the wireless industry begins to sunset legacy networks. It is also able to support 3G connectivity for regions that do not have a consistent LTE coverage. The TTU-3640 utilizes both cellular (3G/LTE) and peripheral connectivity (Bluetooth/Wi-Fi) combined with our leading ECU (Engine Control Unit) interface to provide fleet managers with instantaneous vehicle health updates when assets are deployed in the field or at remote locations. Backed by the ability to support hosted application features and automatic over-the-air firmware updates via PULS™, the TTU-3640 gives our customers flexibility to customize the product to better serve their needs. The real benefit, however, is within its design and construction. Having both the unit and connector IP67 certified in dust and water, the TTU-3640 is built to last and withstand some of the most extreme environments. With the TTU-3640, fleet managers have access to our industry-leading technology of impact detection and driver behavior with the triple-axis accelerometer that measures motion, aggressive acceleration, hard braking and more. For a more robust solution, the TTU-3640 can be activated with CalAmp’s Crashboxx™ as an option to enable advanced crash management when in use with the vehicle. 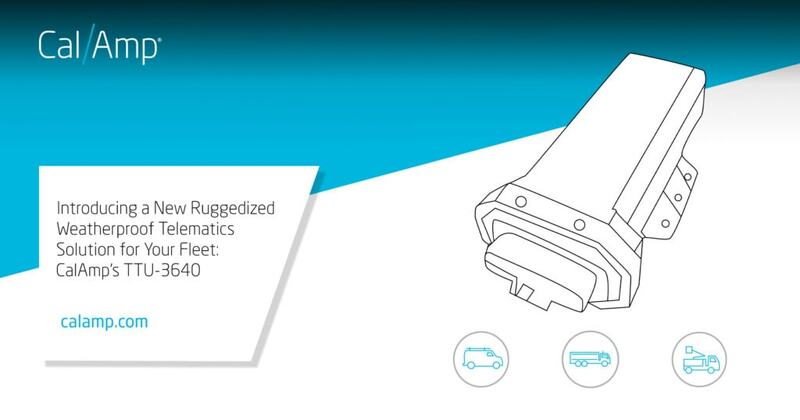 In summary, the rugged TTU-3640 integrates the vehicle bus directly onto vehicles and assets. This flexibility helps consolidate the number of devices needed to build out a full-scale solution for our customers and further simplifies their fleet’s supply chain management and operations with asset tracking and overall vehicle maintenance costs. The expanded processing environment allows our customers to build custom applications to leverage the vehicle bus data beyond just the location base and accelerometer data. The TTU-3640 is constructed with an optimized form factor to minimize complexity and cost during installation. It is also IP67 certified, constructed to withstand harsh environments and harnesses the latest LTE network for faster updates via CalAmp’s PULS™ tool, allowing our customers to stay ahead of the game in response to the upcoming network migration from 3G to LTE. Learn more about CalAmp’s TTU-3640 telematics solution here and our family of asset trackers here. Contact us here if you would like to discuss your mixed fleet challenges with our team.